John Hartford’s mammoth collection of fiddle tunes (Franklin, TN: StuffWorks, 2018) comprises 176 of Hartford’s original compositions. Most of these tunes are previously unpublished and unrecorded, taken from Hartford’s personal music journals. Compiled and narrated by the fiddler Matt Combs, John’s daughter Katie Harford Hogue, and the musicologist Greg Reish, the book illuminates Hartford’s creative process through original tune compositions, his own reflections on the fiddle, and interviews with family and fellow musicians. The volume includes more than 60 of Hartford’s personal drawings—ranging in theme from steamboats and the river, to fellow musicians, home and everyday life—as well as several never-before-seen photographs. 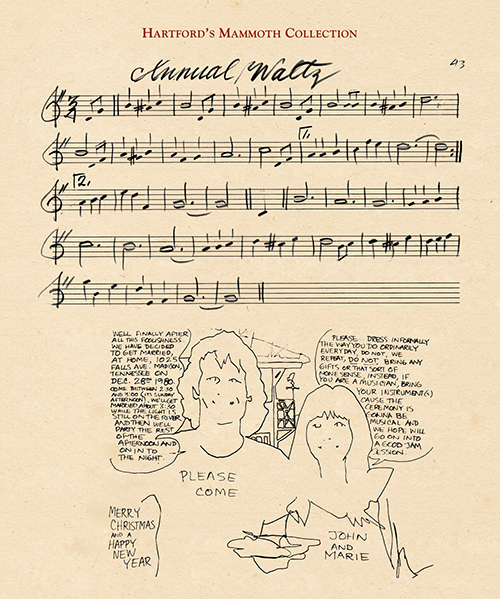 Above, a page from the book: Hartford’s Annual waltz as part of a holiday card and invitation to his 1980 wedding; below, the composer performs the song and tune.